Jackson Associates Research discusses their unrivaled aApproach to customer insights on Worldwide Business with kathy ireland®. Marisa Pope, Principal and Owner and President, Angela Lorinchak discuss the importance of understanding the thoughts and behaviors of businesses' target markets. Pope says that Jackson Associates Research strives to give companies an uncompromised glimpse into the mind of their customer. She explains, "At Jackson Associates Research, we provide the bridge between businesses and their customers. We've been doing that for sixty years. We try to find the ideal participant for a research study, and we offer fantastic facilities in three markets where our clients can come in and watch the research unfold and listen to what their customers are saying. That gives clients a lot of insight, and an opportunity to tweak their product or service and learn more about what the customers want. It gives them the voice of the consumer." GfK has selected the Jackson Research family of companies as their preferred vendor in Atlanta and Los Angeles to host GfK’s user experience (UX) research. GfK’s UX research helps companies create and improve customer experiences for existing or new products and services. To do this, they examine how consumers interact with products and services in realistic situations, often in a lab setting. As part of their ISO 9001 certified quality system, the GfK UX team has a rigorous audit process to demonstrate that facilities conform to quality assurance, information security, and recruiting protocols. In addition, preferred facilities must also be capable of accommodating large groups and offering flexible spaces that can be configured to replicate genuine user experiences such as those in clinical environments and medical offices. Jackson Associates Research, which has been an industry leader since its incorporation in 1957, recently renovated all four facilities in Los Angeles and Atlanta, specifically to accommodate taste tests, sensory research, and UX projects. The facilities’ inherent flexibility permits clients to create spaces that simulate any number of environments to meet their specific research needs. In fact, the facilities have evolved over time from just “focus facilities” to “Focus/FLEX facilities”. In total, Jackson’s four facilities boast 18 focus rooms with observation and adjacent client lounges that seat up to 25 guests, a 1200 square foot auditorium into which clients can drive cars, a 1000 square foot commercial kitchen with walk in refrigeration, and 3 CLT rooms, one of which is capable of seating up to 32 people classroom style. Join us in congratulating Aza on her promotion to Research Director. Learn more about Aza on our Jackson Adept Executive Team page. It’s true. Jackson and Adept have merged. For decades these independent companies have provided the highest quality data collection services in their markets. Now we’ve combined forces to offer even more. Local expertise? In our sleep. 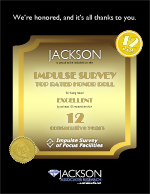 Thank you for helping our Jackson Perimeter facility to remain on the Impulse Survey of Focus Facilities 10+ Year TOP RATED Honor Roll for TWELVE consecutive years of excellent ratings by researchers.